Bali Spa It is located 10 minutes away from the airport by car and near DFS and Plaza Bali which are good places for shopping. 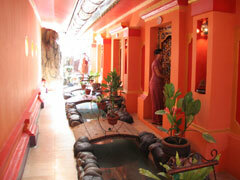 Galuh Bali Spa has unique 12 treatment rooms that each has a color theme of red, blue, green or orange. 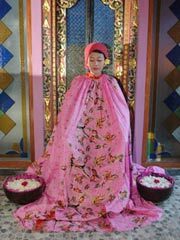 Packages for a couple and Balinese costumes are available for family are popular. Single treatments are also reasonable, so you can combine them as you like! 【Include】CD-R and printed photos including a large size. 【Include】 CD-R and printed photos including a large size. 10 photo shootings with Wedding Costume or Dance Costume with CD-R and printed photos including a large size. 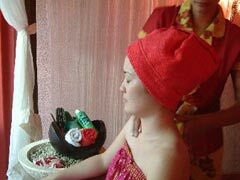 Massage using the essencial products of seaweed and aloe vera including Aroma Foot Bath Body Wash before the treatment and Hot Shower and Lemon Tea after the treatment. 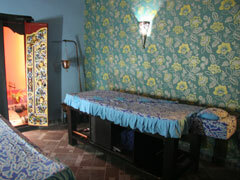 Shiatsu Massage by the skillful therapist to stimulate all the points of the body. Before the treatment including Aroma Foot Bath Body Wash before the treatment and Hot Shower and Lemon Tea after the treatment. 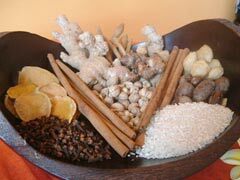 Massage through legs to waist Including Aroma Foot Bath Body Wash before the treatment and Hot Shower and Lemon Tea after the treatment. Washing legs with peppermint soap, and massaging with oil to remove muscle stiffness to recover from tiredness and improve blood circulation. Relaxing massage with aroma oil to improve blood circulation including Aroma Foot Bath Body Wash before the treatment and Hot Shower and Lemon Tea after the treatment. 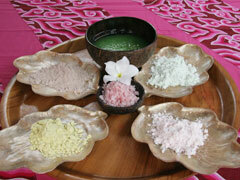 Aroma foot bath & body wash for before treatment, hot shower, lemon tea for after treatment included. Combination Stone massage, Whole body by body lotion, Aroma foot bath before treatment and body wash, Hot shower and lemon tea after treatment. Lunch or Dinner after the Treatment. ◆ Booking by more than 2 people: free transportation is available. Children can wait in the treatment room. There are menus for children over age 12. 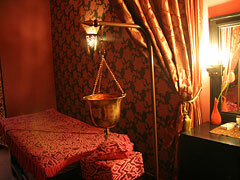 ・You can request a favorite type of the treatment room from red, blue, green or orange. Please, let us know which type you want. There is free swiming pool. please bring your own swinming wear. It is a very unique spa. 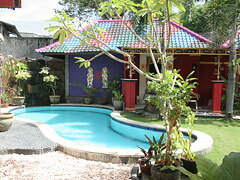 It has exotic gate, lobby and treatment rooms. Aromatherapy massage was done smoothly. I felt like I was brought to another world by the aromatherapy scents and the unique room.